Boxcutters, Teaspoons, Jigger, Shaker Classic/Boston, Citrus Juicer, Strainer, Tumbler Glass. Shake tequila, limoncello, lemon juice and simple syrup with ice; pour over ice in a chimney glass. 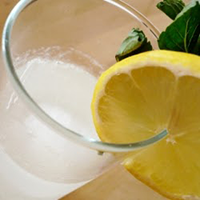 Top with club soda, garnish with a lemon wheel and serve.